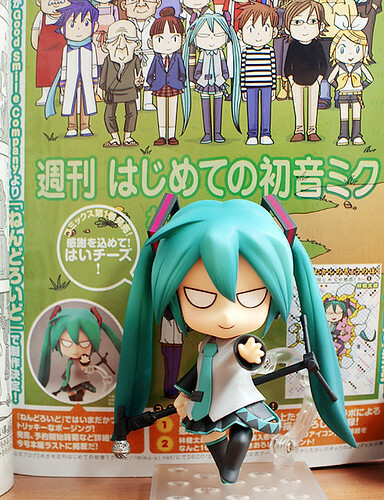 Nendoroid Hatsune Miku: Mikumix version? Mikatan has just posted a photo of the upcoming new version of Nendoroid Hatsune Miku which is based on the 4-panel manga Mikumix and the famous PV Mukashi Mukashi no Kyou no Boku. Seeing that the master figure has been shown there, I guess the pre-order for this (exclusive?) Nendoroid should be available shortly. Anyway, it seems like Mikatan is going to announce it on her blog soon, and that’s when we are going to have some more tidbits regarding this evil-looking Miku. ← Is This GumaGuma V’s Nendoroid Design! ?